For this project, we were interested in the look and feel of stress on the CMU campus. The original intent was to make our piece interactive and crowd-source in realtime people’s thoughts and feelings on stress. Technical difficulties and a lack of time however forced us to consider an approach that was not real-time, but achieved the same goals. The piece thus works as follows: a participant listens to a video question about stress from the last participant, answers this question with another video, and finally records a video question for the next participant. We were intrigued by this self-propagating feature of the piece because we believe it adds a feeling of genuineness and authenticity when the questions about stress come in the form of a dialogue from a peer. 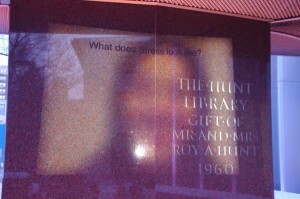 The piece was projected on the memorial right in front of the Hunt Library – a location where we were sure to find stressed college students.